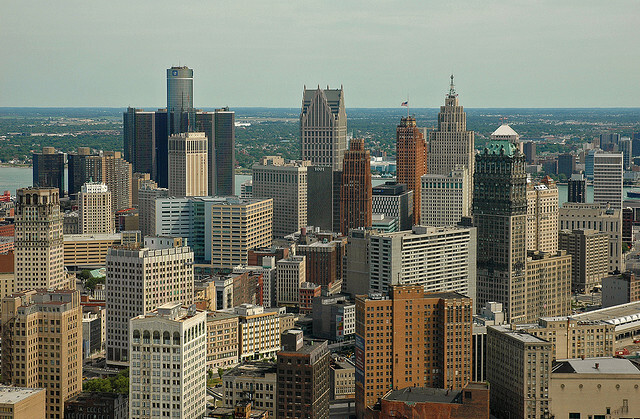 Officials sign off on a Detroit light rail route, with hopes that it will contribute to commercial and residential revitalization. Photo by Ian Freimuth. The São Paulo Metro signed a $862 million contract to build an 11-mile above-ground monorail to connect the city’s airport to the existing subway system. Construction is scheduled to begin next month and finish six months after the 2014 FIFA World Cup (hosted by Brazil) begins. Copenhagen released its bi-annual cycling report, whose notable findings include a city bicycle-commuter rate of 35 percent. The U.S. DOT announced a $562.9 million loan to Amtrak for 70 energy-efficient, electric locomotives for the train service’s Northeast Corridor. The loan is part of the Federal Railroad Administration’s Railroad Rehabilitation and Improvement Financing program. The Project for Public Spaces released recommendations for improving Birmingham, Ala. residents’ access to healthy foods, which include strengthening the city’s local farmers markets and creating “Healthy Food Hubs” that offer both quality foods and nutrition classes. Integrated cycling facilities—both on trains and at train stations—creates multimodal transit options, increases train ridership and reduces personal car use, says a new report from the Los Angeles County Metropolitan Transportation Authority. Detroit’s light rail development gained ground with city and federal officials agreeing to the rail’s route, which will run from the Rosa Parks Transit Center, through downtown, and north to the State Fairgrounds. Officials hope the route will encourage residential and commercial reinvestment. The European Union’s Committee of the Regions—comprising Europe’s regional presidents and mayors—met in Brussels and adopted a key transport opinion drafted by Mayor of Lisbon Antonio Costa, supporting the ambitious roadmap of upgrading Europe’s transportation system by 2050. In March, California’s gasoline consumption decreased by 2.7 percent and diesel fuel consumption decreased by 6.9 percent, according to recently released numbers from the California Board of Equalization. A new study, conducted by the Economist Intelligence Unit and commissioned by Siemens, assessed which cities in North America are the highest environmental performers and found San Francisco to be the greenest. The study is part of the ongoing Green Cities Index series. Not-for-profit organization Everybody Walks began a campaign collecting individual walking pledges. With benefits spanning from saving gas money to reducing cholesterol, it’s clear that walking as a mode of transport is a good investment. In an effort to improve safety, the U.S. Federal Railroad Administration awarded the High Speed Rail Authority and Caltrain a $16 million grant for a new signaling system. Growing up in highly urban areas primes individuals to react intensely to stressful environments, suggests a new study. Nissan automakers announced its new 88 Plan, which includes brand enhancements by releasing a new vehicle model every six weeks for six years and growing its premium luxury vehicle series, Infinity. To avoid possible car congestion resulting from a 53-hour Los Angeles highway closure later this month, the Los Angeles County MTA boosted public awareness by creating a website, a downloadable widget clock, an embeddable graphic banner for upload to personal websites, a video featuring TV celebrity Erik Estrada, and live chats. Portland Mayor Sam Adams and U.S. Congressman Kurt Schrader presided over a ceremonial groundbreaking for a rail-pedestrian-and-bike bridge to connect Portland and Milwaukee. “Hopefully this is the type of project that will show the rest of the country that infrastructure spending isn’t, quote, ‘just spending’,” Schrader said.